June 10th is National Iced Tea Day - Now add booze! and no one said you couldn't add a little spirit! It's a perfect time of year for iced tea. It's summer, it's hot and iced tea is refreshing on a sultry day. You just want to sit out on the porch in a rocking chair with a tall glass while you contemplate the birds and the bees. This is not the Long Island Iced Tea cocktail of the 70s. Those were the days before the current DUI laws. 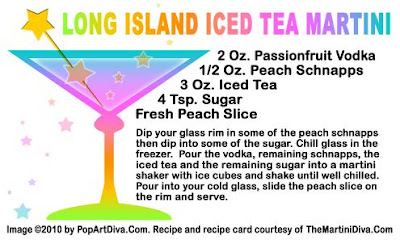 Here's what's in a classic Long Island Iced Tea: Equal parts of vodka, tequila, rum, gin and triple sec with some sweet and sour and a splash of Coke thrown in. It did taste like iced tea and therein lay the danger of the classic recipe. It tasted like iced tea, it looked like iced tea, but you were swilling down a big honking glass of almost pure booze. Very sneaky and very dangerous and maybe someday I'll tell you the trouble I got into drinking just one of those, but not today. Today I'm older and wiser and I have created a more responsible Long Island Tea experience for you! My recipe actually has iced tea in it!